The Catan Junior edition takes families with children ages 6 and up to a place quite different from Catan as we know it. There are no “settlers” around here. Instead, the players represent pirates who build their hideouts - called pirates' lairs - all over the island and set sail to find new places and build more pirates' lairs there. Catan experts will easily recognize that many essential elements of the “big” Settlers of Catan game are included in the Junior edition, which - in accordance with the theme - have different names now. Pirates' lairs are built adjacent to islands; by means of these lairs, the players receive resource tiles. These tiles are used to build ships and more pirates' lairs or to buy development cards (which here are called “Coco tiles”). And if you want to build a pirates' lair, besides a lumber tile and a wool tile you also need a cutlass tile and a molasses tile. Although in the Junior edition some rules were simplified, so that also 6-year olds have no trouble keeping up, it is still unmistakably a “Settlers of Catan” game. 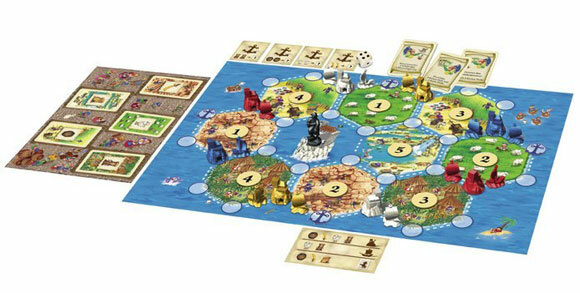 Catan Junior is not just a game for kids but a genuine family game, to be enjoyed by both adults and younger children. Glover gets distracted by the exciting pirate theme in the board game, Catan Junior by Klaus Teuber and Mayfair Games. A game overview and review by Tom Vasel and his girls. Being a fan of the classic game The Settlers of Catan (SOC), I couldn’t wait to someday introduce that world to my young daughters (ages 5 & 8) and my students in my kids board gaming group. However, I didn’t think they were quite ready for the complexity of SOC and would probably get confused by the rules and strategy or fatigued by its running time. Enter CATAN JUNIOR by Mayfair Games, a Catan game designed just for younger players…OR IS IT?!?! Let me just start off by saying that both my wife and I have played a fair share of SOC with expansions, but after playing Catan Junior (CJ), we immediately both agreed that CJ would be an excellent way to introduce ANYONE of any age (particularly casual gamers) to the world of Catan! Since many gamers are probably already familiar with how SOC gameplay works, I’ll make lots of comparisons to CJ that way. CJ is basically a streamlined SOC. The theme of CJ is pirates! Yay! Who doesn’t love pirates? Your goal is to be the first pirate to build seven Pirate Lairs before your opponents do. Pirate Lairs are the equivalent to settlements in SOC (there are no pirate cities….). In CJ, there isn’t one large island that generates many resources, but many hex-shaped islands that each generate a single resource, with water lanes separating the islands. The placement of these islands on the board and rolled number needed to generate resources have already been preselected. This makes setup A LOT FASTER than in SOC! Depending on which color you choose, the game board has pre-marked where your first two starting pirate lairs are placed as well as one pirate ship. The pirate ship is the equivalent to a road in SOC. Rules for building more ships and lairs in CJ is similar to SOC in that you must have a certain amount of resources to build them, and the ships must be built next to your lairs and vice versa. A difference is that you don’t have to be two intersections away from another lair to build your next one. This makes it easier for younger players. There is still strategy on choosing the direction to build your ships on the map to help you gather resources. Another similarity to SOC is that, instead of a Robber, there is a Ghost Pirate! Ooooooo! He works basically the same the robber, but looks cooler! When a player moves the ghost pirate to an island, they collect 2 of that island’s resource from “the bank” and island now won’t generate resources for anyone until the pirate is moved again. One of the biggest differences/additions to CJ is the The Marketplace, which replaces the trading-resources-with-other-players mechanic. Printed on the side of the board (on the shore) are carts which, at the beginning of the game, will hold one of each resource. On their turn, a player may freely trade 1-for-1 with the marketplace to get a resource they need. Because of that, what the marketplace has to offer is always changing. I like the marketplace idea because it helps prevent arguments/hurt feelings with kids if no one will trade with them. (The rules state that the trading mechanic can easily be put back into the game if you’d like however!) There are no ports in CJ, but a player can always trade 2-1 with the bank to get a resource they need. **THE BOARD ART, LAYOUT, AND THE COMPONENTS HAVE BEEN UPDATED FOR THE BETTER THAN WHAT IS SHOWN ON THE IMAGE ON THIS PAGE** So check out updated images on sites like BGG or around the net. The components are excellent! Resources are NOT cards but thick cardboard tokens. In fact there are no cards in this game at all. Everything is either thick quality cardboard (resources, Coco tokens, building menus) or plastic (lairs, ships, ghost pirate). My only gripe is that I prefer wood to plastic, but the detail with the plastic looks cool so… All the pieces are durably made with kids in mind, but I like them as well! The board is two sided and very colorful and exciting to look at. One side is the 2-player board and the other is the layout for 3-4 players. Unfortunately, there isn’t a way to play with more than 4 players. What I really like is all the concepts and strategies (planning your route on the board, resource management, etc) you learn in CJ will carry over to SOC. I feel confident that when I do introduce SOC to my daughters and students, they will grasp the basic gameplay quickly because of their CJ experience, allowing me to just focus on teaching them the deeper gameplay changes that SOC brings, and they won’t feel quite as lost as if I were to have started them out with SOC. That goes for adults as well! My wife said she wished she would have learned CJ first as it would have made SOC a lot easier to quickly grasp. I rate this game a 10 for Kids and Family Gamers with kids ages say age 9 and under. For other gamer types, your milage will vary, keeping in mind it is designed for a younger audience. I do feel it really is worth considering as a better “gateway” into Catan (and designer games in general) than the full SOC game. It not only is fun to play, but fun to teach. It’s wonderful watching kids figure out the strategies that you know, as an avid gamer, will serve them well as they mature and learn more challenging, complex games. Since this be a pirate game, I’ll be obliged to offer a pirate review…aargh! This be a game that gets two thumbs (er…at least a thumb and a hook) up from this salty captain. Since bringin’ it to me cabin and requesting parlay with me crew, it has been played at least once a day. Overview With a similar set up, this game offers far less complexity than the original Settlers of Catan. Furthermore with streamlined trading and building rules it moves much faster for the younger crowd. This is exactly what I expected from a “Junior” game. What I didn’t expect was that this game is how much the adults who play enjoy it too! For once there is a kids game I don’t mind playing a few times in a row! Materials This is a game build to last! The cardboard from the tokens to the box are of high quality that will definitely withstand heavier than normal wear and tear. The plastic feels a bit thin, but the molding ensures that they won’t smash if stepped on. This is a well-built game. Conclusion Family gamers rejoice, this is truly a family game. For my “crew” there are older kids who are just able to play the game and younger kids who are far too young to try. The great thing is that once the older kids outgrow it, they will still play with the young ones. To take this a step further, Casual/Avid Gamers rejoice as well. This is a very easy game to teach and would be a great intro to Settlers for the game-wary! Be ye captain or crew, I highly recommend ye find yerself a copy of this Tot-targeted Treasure. Get a map and plot a course to yer Friendly Local Game Store (where all the greatest of treasure lies)! Of course it isn’t- this is a kids game, do you think I’m that dumb? But seriously, it isn’t good for gamer adults. My 6 year old son likes this game. My three year old son doesn’t. That means I get to play it. I am not good at this game. The game is a little slow paced for kids. I enjoy playing games with my kids, but I don’t know if I really enjoy this game. This isn’t his first choice, he would rather play Forbidden Island, Dixit, or King of Tokyo, but this is a good game when you need a break from those. Also this one is alright to play with just 3 players, Dixit is a little more difficult unless you make up your own rules. Overall the game is playable, and the art is neat. The components are cardboard and wimpy but that’s okay. Kids ruin things. Well, mine do. I tried this out with my six year old son at one of the gaming rooms at Comic-Con last year (2013). The level of distractions at CC might have something to do with my boys lack of interest – he jumped ship within 4 rounds, but I found it quite enjoyable. For those seeking an intro to Catan, or something less resource intensive than the adult game, I recommend a run at Catan Jr. I also won a stuffed sheep! My family has really gotten into gaming in the last couple of years now that my son can understand following rules and such. Settlers is a bit above his concentration and understanding. Catan Junior has been great for him. He gets the strategy and can win on his own. This is similar to Settlers in a couple of ways. It’s a resource management game. Try to collect to by ships, pirate coves, or cards. The major differences are, the board is pre-set, there is only one d6 so there is equal chance of getting any resource, and the board trades are simpler. The strategy is basically the same. The end game is a bit quicker. Get 6 or 7 pirate coves out and you win. It plays in about 30 minutes, which can be a stretch for some of the little ones out there. If you are playing with a little one between about 4 and 6 this is a great introduction to resource management. If you don’t have any that young you won’t like it. It’s fast and easy, but starts to give kids an idea of strategy. I do really enjoy this version. I didn’t enjoy the game nearly as much Catan and would not recommend it to fans of the originaln. It seems too watered down and I enjoy the original much more. That said, this version is PERFECT for kids or for quick games. I don’t need a time-saver version or a “jostle-proof” version, so it wasn’t for me, but I can easily see how it is good for an entry-level version. All in all, not bad, just not for me! 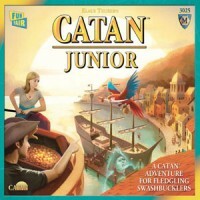 Add a Review for "Catan Junior"